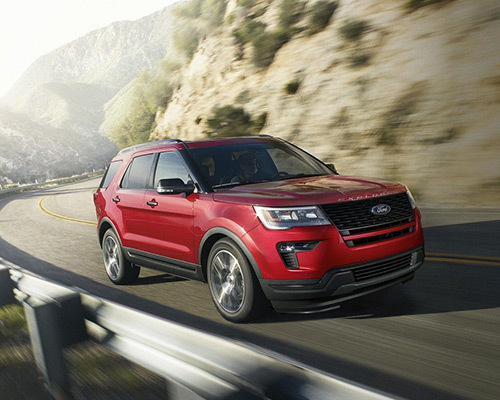 Serving as the most desired large sport utility vehicle (SUV) in Long Island NY is Ford’s Explorer. Iconic in the sport utility class, the most recent Explorer offers up some significant enhancements, yet still provides buyers and leasers all the dependability of past editions. Want to learn precisely why the Explorer from Ford is definitely ready to make good on the buzz? The tag along with the Sayville Ford team as we give you an inside look at the impressive inclusions built into Ford's current version of the legendary Explorer. Having 10 external and three inner color options for you to choose from means you may individualize your Explorer just the way you want it. You can journey in vaunted style with options like multi-contoured front seats, second row bucket seating, a heated steering wheel, and real wood insets. The optional eight-inch (in.) color LCD display in the dashboard empowers you with effortless control of tech systems, such as SYNC 3, 911 Assist, and AppLink. You are able to enjoy your favorite songs and podcasts in the best quality with a 12-speaker arrangement and the Audio package from Sony with Clear Phase and Live Acoustics, as well as HD Radio. There are three assorted motors (some dependent on model version) offered with the Ford Explorer, and each one is ready to establish a new echelon of SUV power. The 3.5-liter (L) Twin Independent Variable Camshaft Timing (Ti-VCT) V6 grants you 290 horsepower (hp) and 255 pound-feet (lb-ft) of torque. For those shoppers that would rather have something a bit more eco-friendly, you have two EcoBoost engine choices: The 3.5-L EcoBoost V6 (which grants you 365 hp and 350 lb-ft of torque) and the I-4 2.3-L EcoBoost (which puts out 280 hp and 310 lb-ft of torque). The latest Explorer gives you more than enough room for passengers and payload alike whenever you, your family, or your friends get out and journey outside of the boundaries of Long Island. Even with seven passengers on hand, you will still have an amazing 21 cubic-feet (cu-ft) of equipment storage. However, if you are short on riders and heavier on cargo, the Explorer's back two benches of seating drop down onto the floor for increased cargo area. When the passenger seat rows are both folded down, you can make use of 81.7 cu-ft of storage space. With only the final row dropped down, you have the chance to leverage 43.9 cu-ft of space. With the seating configuration being so accommodating in the Ford Explorer, it is a simple task to swiftly raise or drop down the rear seating to handle both riders and luggage. Containing ample seating for up to seven, a large portion of cargo storage to handle all of your equipment, and AdvanceTrac with Roll Stability Control, Explorer XLT makes putting the rubber on the asphalt into a comfortable and secure adventure for everyone. Taking on your everyday commute is likewise rewarding with a leather-trimmed steering wheel and shift knob, six-speed SelectShift automatic transmission, and the Intelligent Access with Push-Button Start tech. Create a dominating reputation no matter where you go through the Explorer Sport’s 20-in. machined aluminum wheels, quad chrome exhaust, distinct blackout layer on the lights, and distinct red accent interior trim. Its incredible potential blends a 3.5-L EcoBoost V6 engine that generates a category-defining 365 hp and a sport-tuned suspension, in addition to the Intelligent 4WD with Terrain Management System. From perforated premium Nirvana leather seating with quilted insets to a warmed steering wheel accented in authentic wood and a twin-panel moonroof that provides breathtaking vistas for the first two rows of seating, luxury stands tall within the Explorer Platinum. Furthermore, the fashionable exterior takes sophistication to the next level by integrating satin-chrome details, including on the new grille, mirror caps, and door handles. 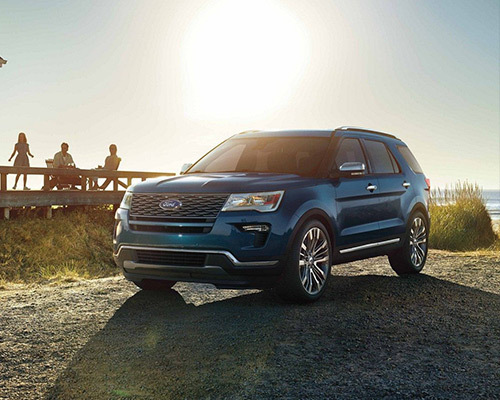 Feel even more comfortable inside your brand-new purchased or leased Ford Explorer by upgrading to the Ford Safe and Smart Package, which features a number of driver-aided features developed to supplement your driving capabilities and safety functions. The roads before you continue to be exceptionally visible with rain-detecting wipers and auto high-beam headlights. The Lane-Keeping program senses when your Explorer begins to wander into another lane and alerts you to the situation. Also, you will question how you could have ever existed with no Adaptive Cruise Control, an addition that allows youto specify the range to keep behind the vehicle ahead of you, all while Forward Collision Warning with Brake Support works to shield you from a possible accident. The brand-new Explorer is an able tower, and with either the Class II Trailer Tow Prep or Class III Trailer Tow packages, you will be able to pull a maximum of 5000 lbs. When it comes to hauling, there are plenty of tools to help make towing both easier and less concerning for you. The standard rear-view display empowers you to keep a sharper look on whatever it is you are pulling. An additional handy hauling feature, the Trailer Sway Control program can sense if your trailer begins to rock and will proactively modify the engine's speed and activate a bit of braking power to keep things under control. The convenience of technology is at your fingertips regardless of where the road leads you in an Explorer of your own with the addition of SYNC 3. This responsive setup utilizes an easy-to-use touchscreen display that showcases the same applications as smart devices and responds to your voice commands, such as calling someone, firing off an SMS message, or playing the latest hits from your digital library. It also utilizes a navigation feature to help locate the restaurant you want to pay a visit to and display exact directions for you to follow along with turn by turn. No matter which kind of car you drive, your well-being should serve as a major priority. 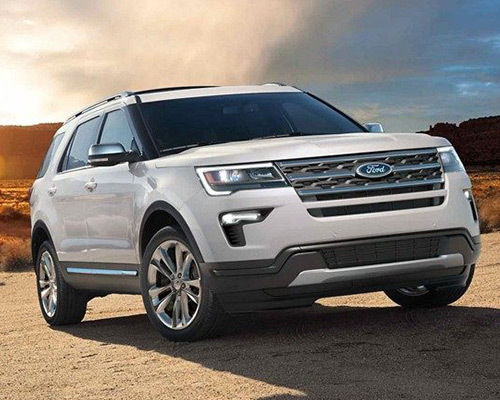 Consequently, the most recent Ford Explorer stands as an outstanding option for those who are interested in leasing or buying a top-notch SUV. The AdvanceTrac with Roll Stability Control and Curve Control configuration is found in all Explorer trims and works via noticing any wheel instability and altering engine torque in an attempt to help you maintain traction. The adjustable cruise control feature lets you fix the space you want to maintain in between you and the automobile ahead of you. If that automobile decelerates, this feature immediately alters your own traveling velocity to avoid any risk of a collision. The Intelligent 4WD with Terrain Management program helps you easily shift into one of four unique settings in order to match the current road conditions. In order to help you keep a consistent speed as you head downhill, the latest Explorer has the Hill Descent Control feature. The latest Explorer is easily the frontrunner in the SUV marketplace. With this mind, it makes plenty of sense for Sayville Ford to present this SUV to those who are searching for a potent mix of utility and versatility. It is not often you discover a SUV that has all of the things required to own work, tow, and store at class-leading level, but Ford has created precisely this in its most recent Explorer. If this sounds like exactly what you are browsing for in the next SUV you buy or lease, feel free to stop by and chat with your friends at Sayville Ford.